These three pairs of sublime choral settings span well over 350 years. The earliest is Allegri’s Miserere, a work considered so precious it was kept secret until Mozart heard it and famously transcribed it from memory. James MacMillan’s 21st century companion piece is a transcendent reply to this challenge from history. Malipiero’s and Pizzetti’s resumption of a fractured friendship resulted in their mutually dedicated but differing settings of De profundis. Puccini’s brief but exquisite Requiem commemorated the death of Verdi, while Pizzetti, a late admirer of Puccini, revealed his empathy with vocal polyphony in a full setting of the Requiem Mass. 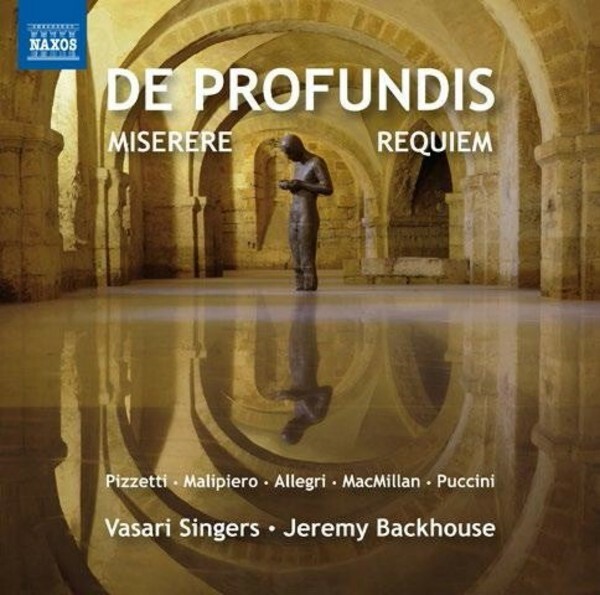 The Vasari Singers will be adding De Profundis to a growing series of highly popular choral discs in the Naxos catalogue. These include 'Great British Anthems' (8572504), described by Gramophone as “essential listening”, and 'A Winter’s Light' (8573030) hailed as “sensational… one is in awe before a choir that can turn in [such] magnificent performances” by International Record Review. The musical jewel that is Allegri’s Miserere will always be a big attraction, and while James MacMillan’s beautiful Miserere was commissioned as a companion work and recorded by The Sixteen, they didn’t include the Allegri in their recorded programme. These imaginative pairings and the evocative music throughout this CD will make it a release few can resist.